Hanoi (VNA) – Numerous activities to support disadvantaged people across the nation will be launched in the 2019 Month for Humanitarian Activities. This year’s programme, themed “Connecting, Sharing, and Spreading”, will see the Vietnam Red Cross Society (VRCS) play a key role in mobilising and connecting millions of people to share with and provide opportunities for disadvantaged people. It will start on May 1 and run through until May 31, with peak dates from May 8 (International Red Cross and Red Crescent Day) to May 19 (birthday of President Ho Chi Minh, the first Honorary President of the VRCS). The programme aims to further enhance public awareness and strengthen the Party’s leadership in and the State’s management over humanitarian works. 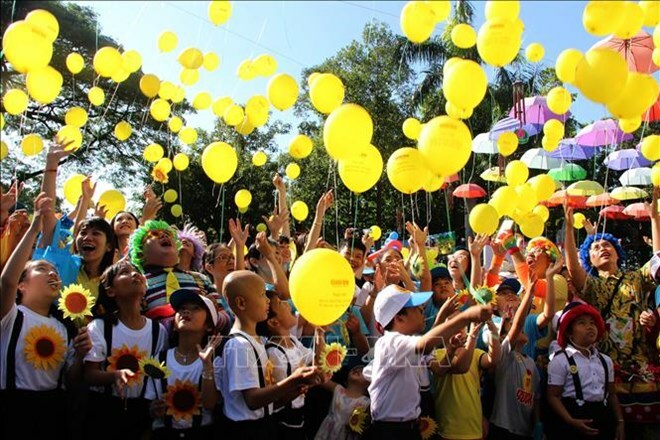 It is also designed to deepen and further spread positive values and traditions of humanity amongst Vietnamese people. Through the programme, the VRCS aims to encourage participation in humanitarian activities amongst agencies, organisations, and individuals, as well as strengthen fundraising activities at the localities to support humanitarian causes, contributing to the building of great national unity and a community of solidarity and mutual support. During the programme, a series of meaningful activities will be conducted such as the handover of fund support for people to improve their livelihood and housing, free health checks and medicine deliveries, humanitarian blood donation recruitment, first aid knowledge and skills training, among others.